2. In a large bowl mix together flour and powdered sugar. Cut butter into the flour mixture using your fingers until the butter resembles the size of peas. 3. In a small bowl whisk together the egg yolk and water. Pour egg mixture into flour and butter mixture. Using your hands mix until dough forms. Wrap in plastic wrap and place in refrigerator for 30 minutes. 4. Remove from refrigerator. Using a rolling pin, roll dough out onto a lightly floured surface to 1/4 inch thickness. Carefully roll the dough back onto the rolling pin. Roll the dough on top of the tart pan. Press the dough into the tart pan and cut any excess dough off the edges. Chill for 10 minutes. 5. Cut a piece of parchment paper to fit inside the tart pan. Place parchment inside tart pan and fill with dried baking beans. Bake for 25 minutes until the dough is golden brown and pulls away from the sides of the pan. Remove from oven and cool for 15 minutes. 6. To assemble: Remove tart shell from pan. Fill with pastry cream and smooth. Starting on the outside of the tart, shingle the strawberries to create a circle. Next, place the blackberries in a circle working your way to the center of the tart. After the blackberries, shingle the sliced kiwis. Finish the tart with 3 raspberries in the center. Heat the apricot jam over medium heat until loosened, about 3 minutes. 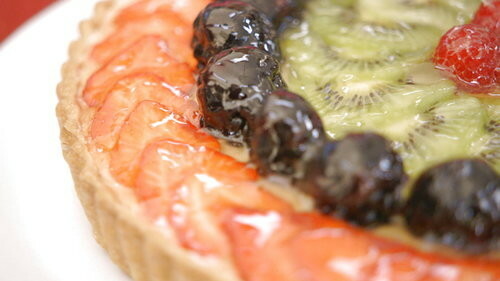 Finish the start by carefully brushing the fruit with the jam to give it a shimmery glaze. Serve immediately. 1. In a medium sauce pan add milk, 1 cup heavy cream, sugar, salt, egg yolks, and cornstarch. 2. Cook over medium high heat, whisking constantly for 5 minutes. Once the mixture begins to thicken and bubble remove from heat immediately. Stir in butter and vanilla extract. Set aside to cool for 15 minutes. 3. Place plastic wrap directly on top of the pastry cream. Place in refrigerator to chill until ready to use (about 30 minutes while tart is baking). Before assembling tart, whip the remaining 1/2 cup of heavy cream to stiff peaks. Fold into chilled pastry cream. 1. The dough needs to chill. If it doesn’t chill long enough it will fall when baking. 2. If the dough doesn’t completely bake you will not be able to remove it from the tart pan. The tart has to be removed for serving. 3. The pastry cream must be smooth and not have any cooked egg visible. It must be smooth and creamy. 4. You can’t forget to add the whipped cream to finish the pastry cream after it chills. If they add it when the pastry cream is still warm it will deflate. 5. No cracks visible in the tart. Crust should be consistent, flakey and buttery. 6. Filling should be light, airy and flavorful. 7. The fruit is the decoration so it should be shingled and placed properly as well as have a light shiny glaze.